Do you use Apple’s Mail application? Would you like to quickly locate a reply email message you sent? Imagine you received a message in your Inbox and that you replied to it. 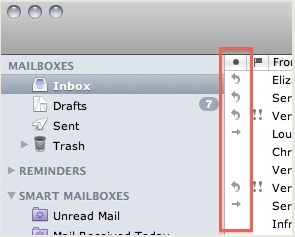 After you send the reply, Mail inserts a curved, leftward-pointing arrow, as depicted in the image below. If you click this left-pointing arrow, Mail will display your reply message. The same is true for messages which you’ve forwarded. The straight arrow pointing to the right indicates that you’ve forwarded a message. If you click this arrow, Mail will display your forwarded message. Read more about Apple, arrow, forward, Mail, reply, view.